The past couple of weeks I have been showcasing some new long sweaters I bought at JCPenney for only $6.24 each after coupon and a gift card. I love to wear leggings in the winter, but I want my tops to cover both my backside and my front side. I can't even begin to tell you how difficult it is to find tops long enough. No wonder so many women are wearing "Leggings as Pants". So when I found all these sweaters at JCP on sale for $14.99, I bought one of each! On this day I paired my charcoal sweater with burgundy leggings. But I also wore this sweater with black pleather leggings on another day and I really like that look much better. Unfortunately I don't have any pictures of that look. I paired my new sweater with another new beanie...yes, I have a problem. "My name is Amy, and I'm a beanieaholic". 😊 I bought so many new beanies this year! I can't help myself. They are so cute! This one I picked up at Forever 21 for only $4.99. My scarf is from a previous season. 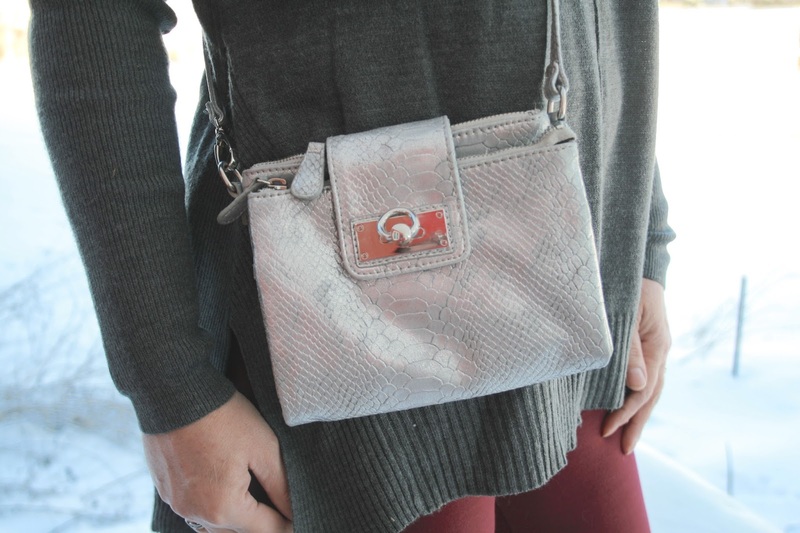 I carried a snakeskin print silver metallic cross body bag. My new OTK boots that I got for Christmas have turned out to be quite practical for my climate. I was always afraid of investing in a pair because I didn't think I'd get much use out of them. But they are wonderful for keeping my legs warm and I reach for them before any of my other boots. I haven't gotten around to punching another hole in the back strap to tighten them, so they keep slipping down on me. That's the only thing I don't like about them. I did just read a tip on another blog that stated that you should look for an OTK boot that has a higher shaft because they stay up better. That's a good tip and if I ever buy another pair I will keep that in mind. However, I had such a hard time even finding a style I liked in a price point I liked; plus I needed to take baby steps in the OTK boot department. I was afraid I would be uncomfortable wearing a pair that was too high. I went up a size in this sweater and bought a size Large because it has a drop sleeve and the medium was a tad un-comfy in the arms. Also, if I went up a size, it was a little bit longer, which I liked. My burgundy leggings are also from JCP. If you missed my last three posts featuring my other three long sweaters, they are HERE, HERE, and HERE. Silver Metallic Cross Body Bag, no longer available, similar HERE, and Black Madden Girl Over-The-Knee-Boots - Famous Footwear - HERE. Ohhh I love gray and burgundy together! Looks so great! Happy Friday! I love your beanie!! And admittance is the first step, Amy---LOL! I've just started getting into the habit of wearing hats in the first place, so who knows? I may end up with this same addiction! I love that you have red leggings---I have a print pair, but it's not my go-to pair----yet! Thanks Jodie! You're so funny! Once you start buying them, you won't be able to stop! This is a beautiful outfit, casual but stylish with your awesome OTK boots. And you're right, it is hard to find sweaters that are longer, you hit the jackpot with yours! Thanks Miriam, I sure got lucky! I've noticed most of the sweaters I bought are sold out or running out quickly! Love these colors together, and that scarf is the perfect finishing touch! I am loving all of your new sweaters and that burgundy colour is super with the sweater and boots and against the beautiful snow backdrop. Thanks so much! I'm getting so bored and frustrated taking pictures because with all snow and cold it's been quite the challenge. I'm soooo liking that grey and burgundy together. I feel an experiment coming on. The beanie looks cozy. I haven't worn mine yet this winter. You've tempted me. Thank you, I was on the fence about these two colors together after seeing the pictures. Amy, I love this outfit so much. So cozy and adorable. I am seeing so much burgundy and gray or black together. It is such a rich combination. In fact, I wear it quite often myself. Thanks for linking up with me On the Edge. Thanks Shelbee! I haven't seen any burgundy and grey together so I wondered about this color combo. Love the gray and burgundy together with the black boots. The hat look so cute and stylish too! I bought one pair of burgundy leggings myself, as I taught it will be nice change to black and dark blue ones. I love them. You combination with neutral grey sweater is great. Thank you for sharing your style with My Red Carpet. Thanks Anna, the burgundy is hard for me to get use to, but it is a nice change. What a great deal on your sweaters! JCPenney always has the best sales and coupon offers. And I say you should go ahead and be a beanieholic when you look as cute in them as you do, Amy! Thanks for linking up with Fabulous Friday.